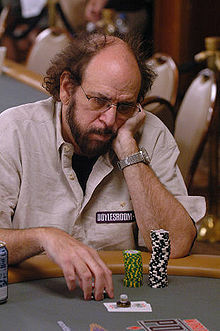 Mike A. Caro (born May 16, 1944 in Joplin, Missouri) is a professional poker player, pioneer poker theorist, author of poker books, and casino executive. In 1978 he contributed 50 statistical tables to Doyle Brunson's Super/System and wrote that book's chapter on draw poker. He acts as a consultant to many casinos, providing odds, and he helped develop the Poker Probe, the first serious commercial PC program for analyzing poker situations. He is the founder of the Mike Caro University of Poker, Gaming and Life Strategy, the world's first permanent poker school. He was one of the few people who believed in the 1990s that real money online poker would work (most people said it would not). He also has made multiple videos, some of which correspond to his books. He was formerly editor in chief of Poker Player magazine and senior editor of Gambling Times magazine. Mike Caro coined the famous poker tells "Weak means Strong" and "Strong means Weak", meaning that players will try to fool other players by acting the opposite way of the true strength of their poker hand. In 1984 at the World Series of Poker he demonstrated Orac (Caro backwards), a poker-playing computer program that he had written. Orac was the world's first serious attempt at an AI poker player, and most poker professionals were surprised at how well it played. Caro was the chief strategist for the Bicycle Casino when it opened in 1984 and was named the general manager of the Huntington Park Casino in 1986. In 1992 he helped organize the "World Poker Finals" at Foxwoods Resort Casino, the first corporate sponsored tournament. He is also a persistent advocate for four-color decks in card rooms and tournaments. Caro developed much of his poker theory in conversations with John Fox and Art Szathmary. As of 2009, his total career live tournament winnings exceed $150,000. His wife Phyllis Caro is director of poker operations at Hollywood Park Casino.